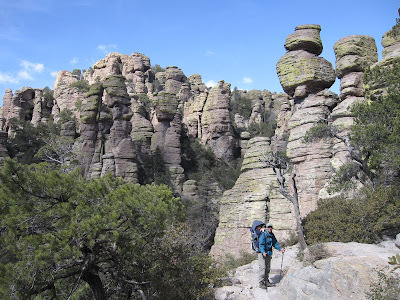 Today we took our third trip to the absolutely wonderful Chiricahua National Monument. 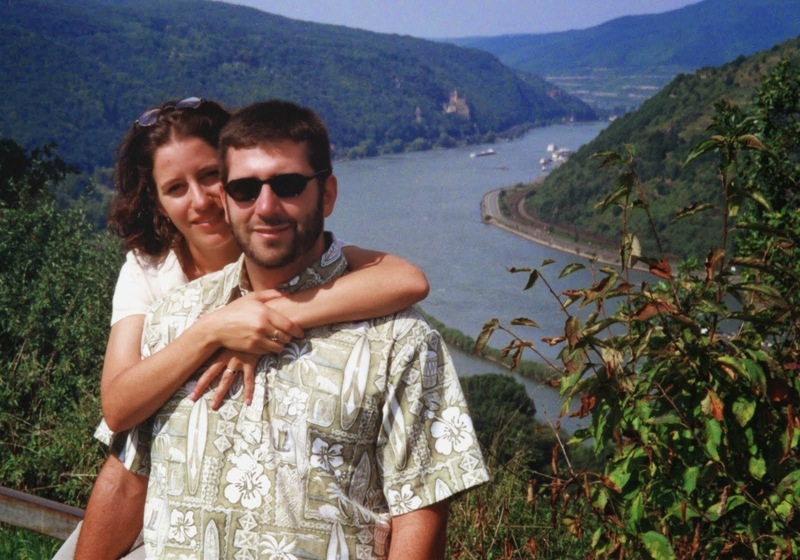 This is the National Park Service's best kept secret and one of my all-time favorites. In fact, despite the well-deserved fame the Grand Canyon gets, there are reasons why I like this little park tucked way down in the southeastern corner of Arizona better. 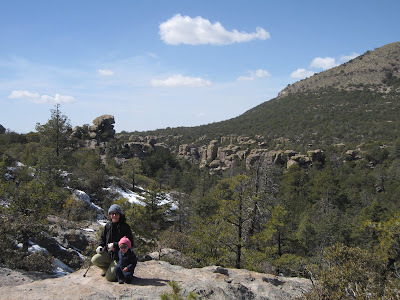 The Chiricahua mountains were formed by a violent volcanic eruption some 20 million years ago. The falling ash was still so hot it welded together to form distinct layers. 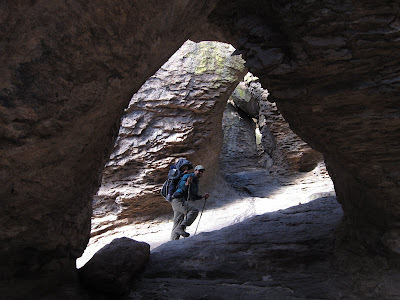 The ensuing erosion, particularly through ice wedging, created the amazing standing columns, grottos, and formations you see here. 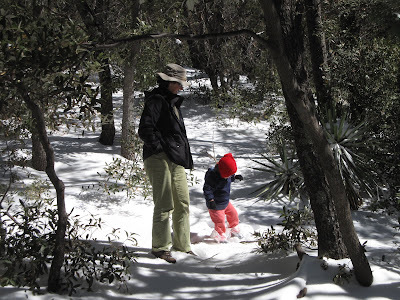 These mountains also contain some really interesting plant and animal species, many of which have Mexican affinities, including Apache and Chihuahuan pines, Mexican fox squirrels and coatimundis. Hilina noticing some interesting formations down the canyon. 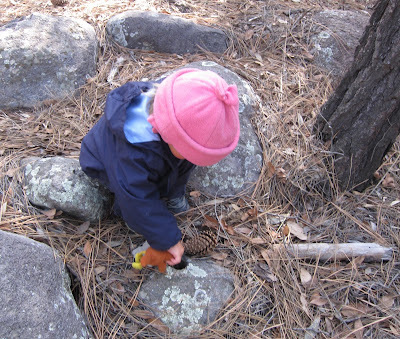 One of them was called "Buba Rock" and then she spent the next 10 minutes looking for the "Hilina Rock", which we eventually "found". 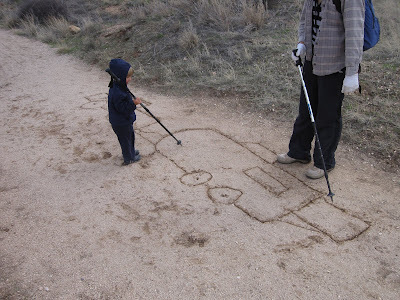 This park also officially entered Hilina into the realm of junior ranger. 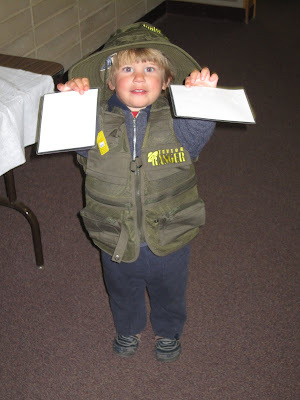 She was so excited to get the junior ranger vest and that ran all around the visitor center telling everyone. Here you can see Hilina showing me on the map where we are going. 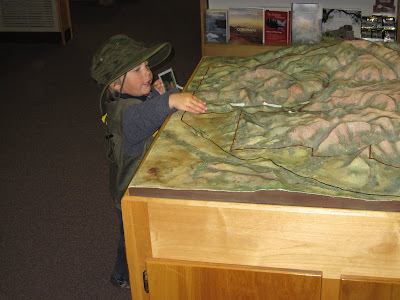 She must have inherited that interest in maps from both me and opa Werner, because she is all about maps and always wants to know the route we will be taking. 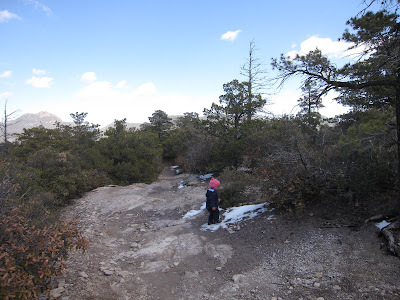 The elevation at the top of the Echo Canyon Loop was about 6700 feet, where some residual snow remained. We did make a small snowman, but Hilina said "let's knock it down" and it was promptly destroyed, much like she does with every tower or building we make with blocks. This place is just such a wonderful place to explore. 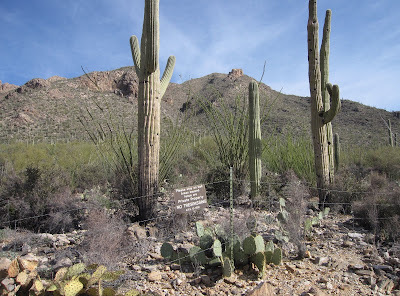 If you are ever in Tucson or SE Arizona, it is most definitely work the drive to visit this unknown wonderland. 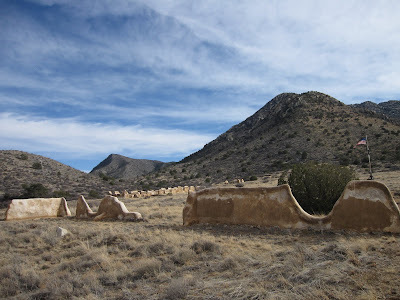 Fort Bowie National Historic Site is one of the only national park units I have seen where you actually have to hike to get to it. 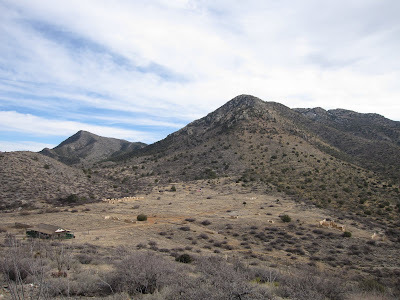 It is the site of an old U.S. Army fort located at a pass in the Dos Cabezas Mountains near the Arizona/New Mexico border that was used to exterminate the Chiricahua Apaches from their ancestral lands in the 1860's. 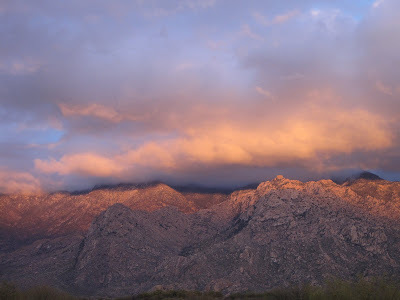 It is the land of Geronimo and Cochise. To get to the old fort takes some effort. It is 20 miles by paved road from Willcox and then 8 miles by dirt road. 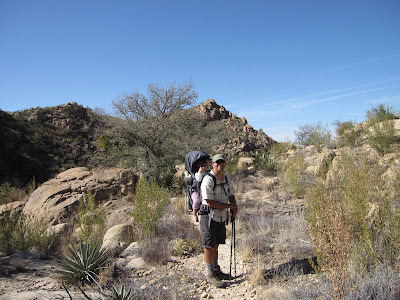 At the trailhead, you then have to walk 1.5 miles to Apache Pass at the ridgeline. Hilina was very excited to see the "old tiny houses" and ran along the trail for over 1/2 mile before tiring. 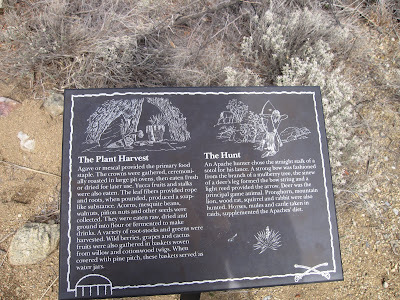 All along the way there are interpretive signs explaining the events of the area and you cross the old Butterfield Stagecoach Mail route. 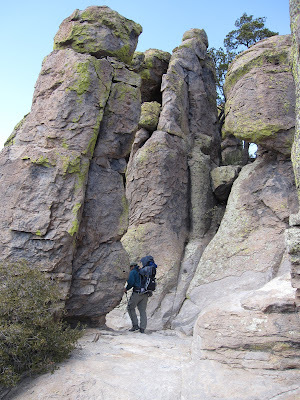 As you approach Apache Pass and Fort Bowie, you see why the fort was built here. 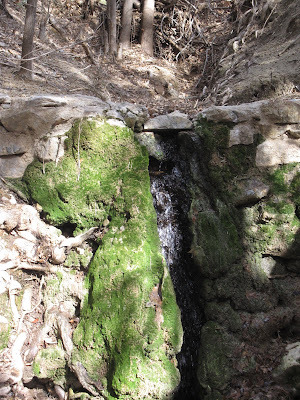 A tiny little spring, which just happened to be the only accessible water for dozens of miles. 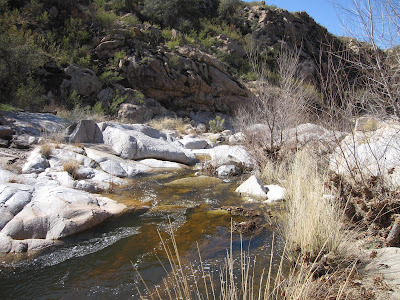 It was this water that sustained the Chiricahua Apaches. 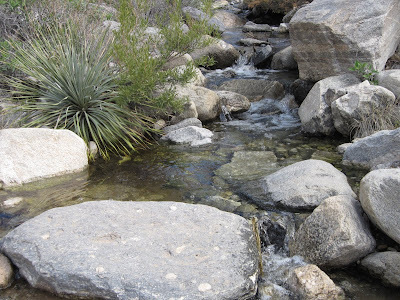 It was also this water that made it a critical stop for the stagecoaches, mail trains, and U.S. Army. They built the fort here primarily to deny the Apaches a water supply and to force them out. 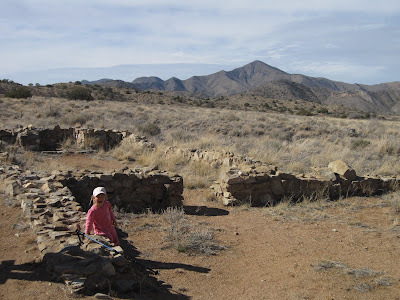 Many battles were waged here, including Geronimo's raids on Fort Bowie for some 10 years after the rest of the Apaches had been killed or rounded up and sent to the reservation. The fort only lasted about 20 years before it was abandoned and torn down. Today, just the foundations remain. 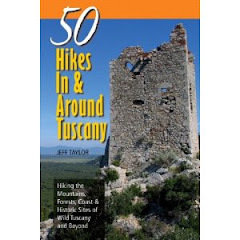 The 1.5 mile hike back go up on the ridge above the saddle to offer spectacular panoramic views of the landscape. The building you see in the lower left is the NPS visitor center. After hiking to get there, you find out the rangers have an access road on the other side of the ridge they use to drive up to the site. But, I didn't mind having to do a little work to visit. It makes the experience much more memorable. 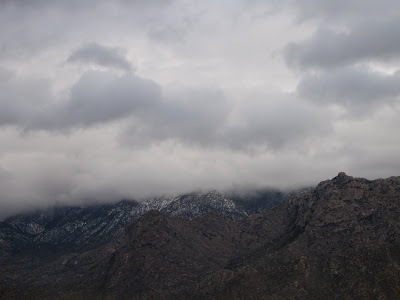 A big El Nino storm that brought massive snowstorms to Nevada, the Rockies, and Northern Arizona has been dumping significant amounts of rain onto Southern Arizona. 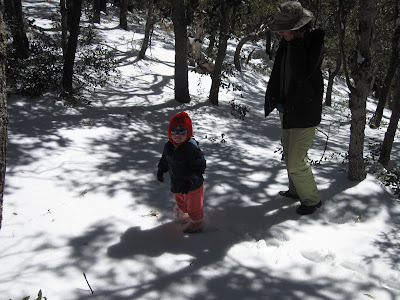 Mount Lemmon, just above our campsite recieved approximately 12 inches the other day. 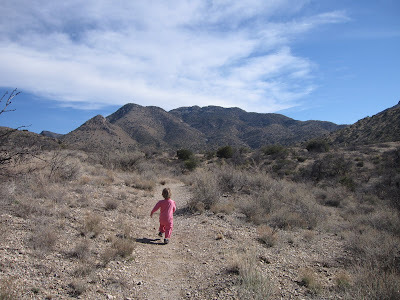 On Saturday, we rewarded Hilina for her patience sitting in the backpack on the multiple days in a row on hikes with a day at the Tucson Children's Museum. 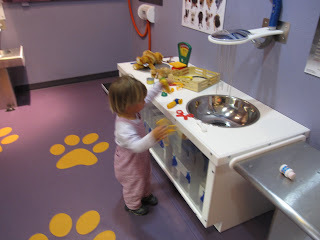 The place was an absolute madhouse of kids on a rainy weekend day and Hilina had an amazing time playing with the exhibits and the kids alike. She LOVES fire trucks...Mostly because she loves that they put out fires. 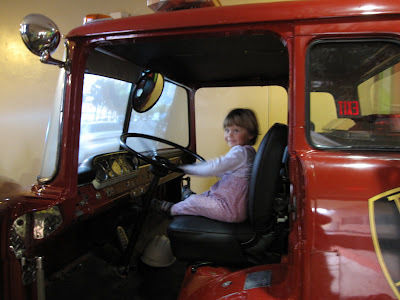 She is also into driving now, wanting to drive the truck, those shopping carts with the plastic cars in front of them, or this fire truck. 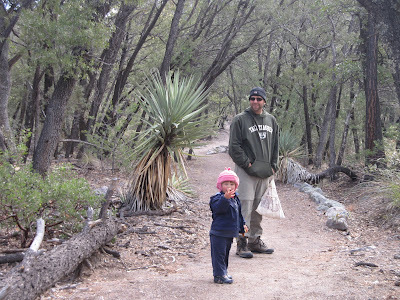 On Sunday, we did a shortened loop hike at Catalina State Park in between the rains. We enjoyed the cooler temperatures and drew animals and characters in the wet sand, which Hilina loved trying to guess what they were (we're not artists after all). Today, we moved our operations south to Tumacacori National Historic Site, approximately 75 miles south of Tucson and about 20 miles north of the border. 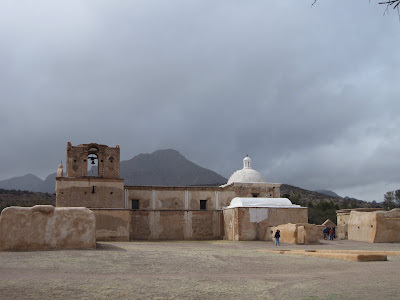 It was an old Spanish mission built in 1691 to "serve" the O'odham and Yaqui tribes of the region for about 130 years. It was abandoned in 1821 following the Mexican Revolution when the new Mexican government ordered all Spanish-born priests out of the country. 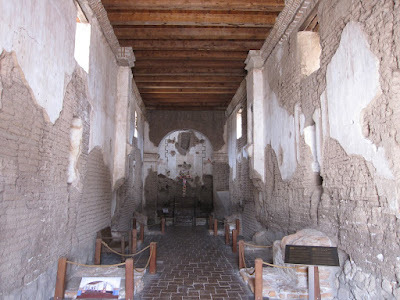 Inside of the Tumacacori mission church. It was brightly colored inside originally, but after being abandoned for more than 100 years (until 1921), including being without a roof after local ranchers took the timbers, the elements took their toll on it. 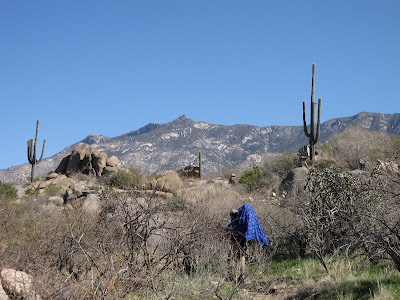 With a rain storm expected to roll in on Saturday, we decided to get in one more hike in the Santa Catalina mountains while the temperatures remain in the low 70's. 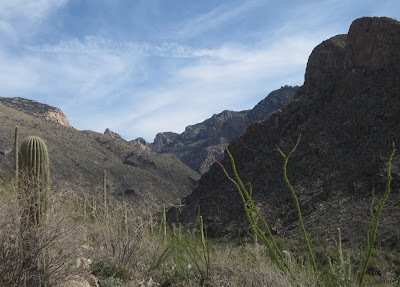 We sort of unexpectedly came across Pima Canyon. 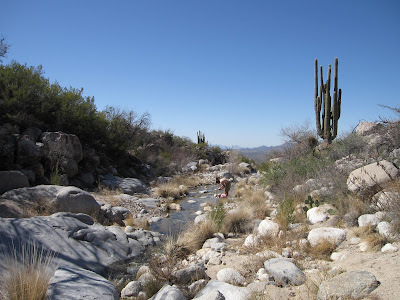 Far less busy than the famous Sabino Canyon, this wonderful canyon with perennial water has a beautiful riparian stretch of cottonwoods, cholla cactus vines that climb tress, and cucumber vines that make for a completely unexpected jungle-like environment. 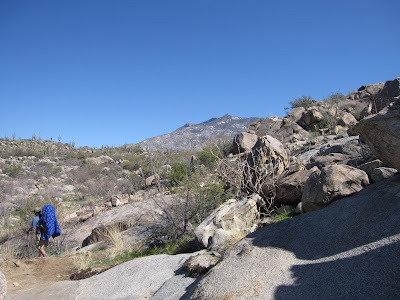 The trail access is only about 5 miles from Catalina State Park in northern Tucson. We were actually heading somewhere else to hike when I saw the sign on Oracle Road for the trailhead and looked up to see the canyon in the distance. So, we said, what the heck, let's go for it. Notice the "No Tresspassing" Sign. There is still room for more homes up to the wilderness boundary! 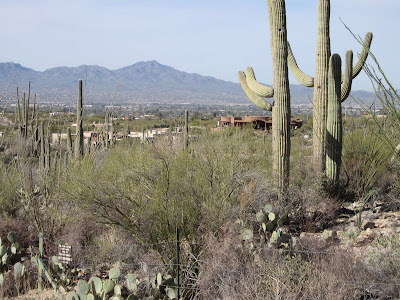 The trail starts at the edge of a ever-expanding neighborhood and the first 1/2 mile of the trail is a county easement that snakes between houses. 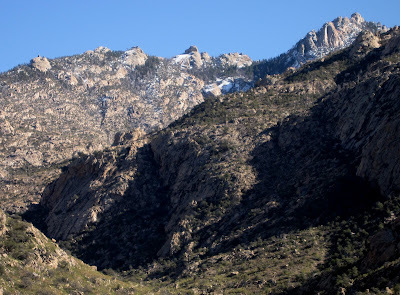 There is a sign that mentions the ever dwindling bighorn sheep population and how they will probably disappear from these mountains as the sprawl continues its climb into the foothills and the increasing numbers of dogs and other disturbances to their reproductive season. On the sign discussing things we can do to help the last remaining bighorn sheep, someone write in marker; Don't buy a home in Tucson! 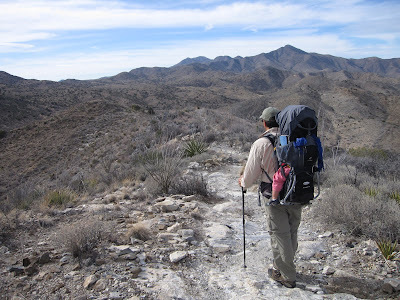 Once the trail enters the Pusch Ridge Wilderness Area, the route enters the canyon and you can leave the humanity of Tucson behind and enjoy the beautiful Sonoran desert environment and look ahead to the mesquite bosque that surrounds the riparian zone of Pima Creek at the bottom of the canyon. 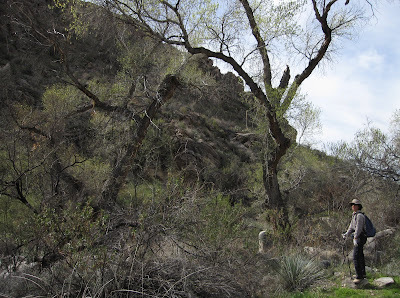 The trail then drops down to the bottom and crosses the creek and next thing you know there are enormous old-growth cottonwoods and dense stand of vegetation. I was surprised, despite the warm weather, that the cottonwoods were already leafing out in February! At the size of some of those trunks, I am guessing they are reaching their maximum age of 150-200 years old. 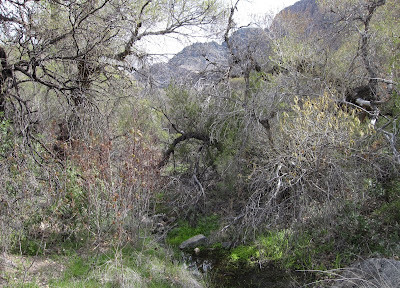 These riparian stretches can only survive where adequate sediment has accumulated, so you go in and out of these patches as the terrain varies and the gradient changes. Where the stream is too steep, no sediment accumulates and the creek bottom tends to be bare rock and thus no riparian vegeation develops. We hiked up perhaps 2.5-3.0 miles until finding a nice little "beach" for Hilina to play on. 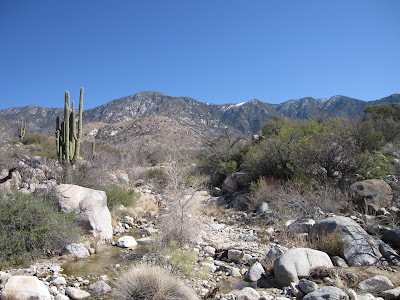 Further up stream, you could see that the creek flows for about 2 more miles until the ridge rises almost vertically up to Pima Saddle and eventually to the 7600 foot Mount Kimball above. We ran across some scientists on the trail who were looking for "signs of spring" and indicated we should look for the yellow-tipped butterfly (which actually has a more orange color to it) as one of those signs. 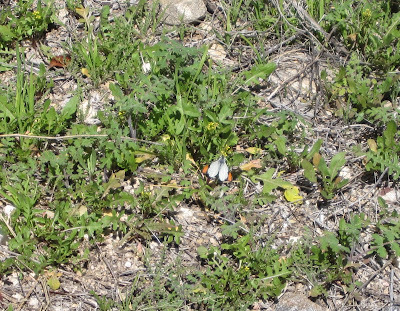 Once we got up to the riparian zone, we started seeing tons of those butterflies. 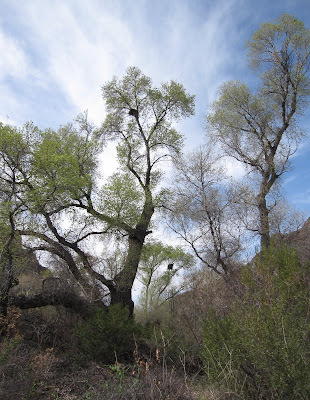 We saw a small unidentified accipiter hawk nesting up on this cottonwood. There is also a next in the tree in the distance. 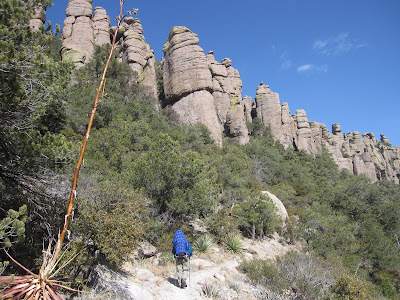 With temperatures around 75 degrees, we took another 6 mile hike, this time up the Sutherland Trail to the Cargodera Spring at the base of the Cargodera Canyon which runs up to the very summit of 9,100 foot Mount Lemmon. 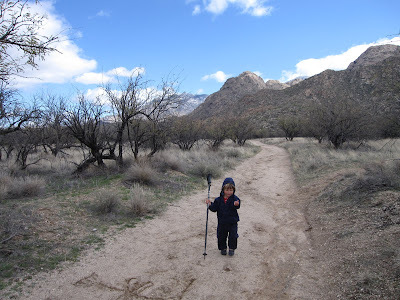 The trail starts at the same spot as the Romero Canyon trail. 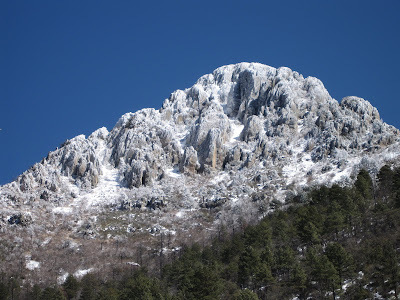 It tends to hug the outside of the mountains, rather than penetrating up into the range following the canyons. 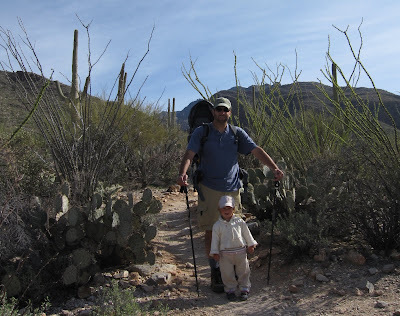 Instead, the trail follows the desert bajada full of saguaros and mesquites. 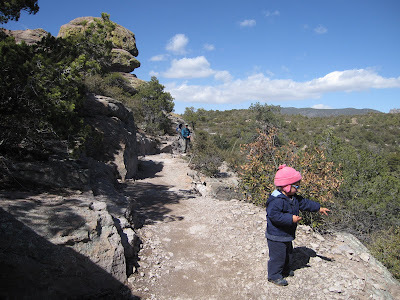 But, it does climb slowly and by the time you reach the Cargodera Spring, you are actually at 3700 feet elevation (higher than Romero Pools). 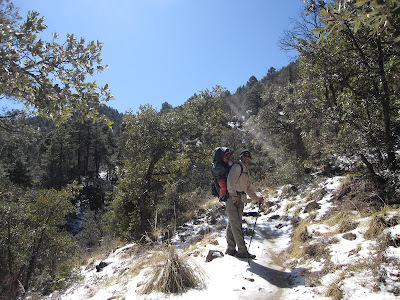 The trail itself is well-graded and much easier on the feet than the Romero Trail. However, there is little shade, so even when it is 75 degrees, it gets really hot with the sun beating down on you. This is especially the case when hauling a two-year old on your back! 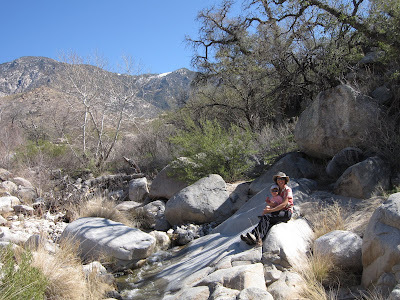 The trail reaches the first crossing of Cargodera Creek at about 2.4 miles (a wonderful smooth-rock waterfall). 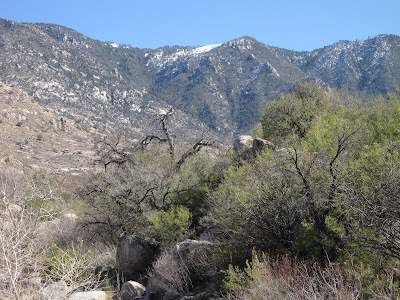 Then, it meets up with an old 4x4 road that parallels the powerlines that run all the way up the face of Mount Lemmon to the small village of Summerhaven at the summit of the mountain at over 8,000 feet. It is definitely a feat of engineering to see those powerlines going nearly vertically up the mountain. The 4x4 road is extremely rocky and much more difficult to walk on than the trail before it. Heading up the road for about half a mile you will see a couple of way trails that drop down to the creek to rest next to the cool waters and under the shade of Sycamores and Willows. Hilina really wanted me to haul her up to the snow up top to make a "snowman". 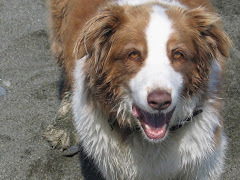 It was hard to explain to her that I was in no position to add 7 more miles and 6,000 feet that lay ahead on the trail. 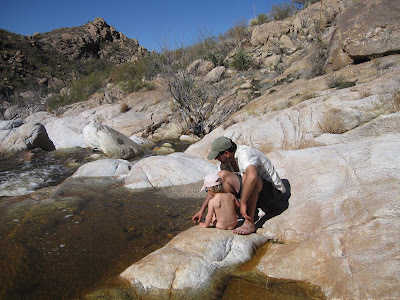 So, it is a sunny 74 degree day at Catalina State Park, so we were thinking, what should we do? 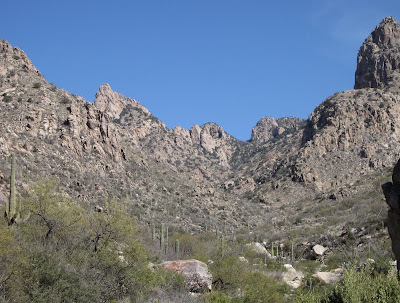 So, we decided to head up Romero Canyon which carves its way deep into the Santa Catalina Mountains. It starts at the valley floor at 2800 feet elevation and ends at the ridgetop at more than 6,000 feet. 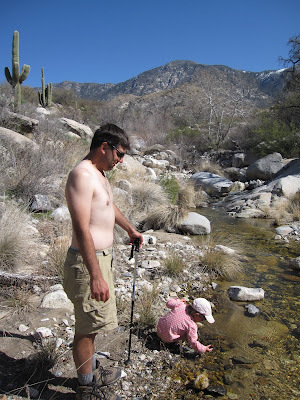 We certainly were not going to do the more than 14 mile roundtrip to the saddle, but we did head off to the Romero Pools, where a stream gathers in nice swimming holes at about 3600 feet elevation. The hike is rocky and steep, but it was such a beautiful day. In addition, the first real tangible signs of spring were visible. 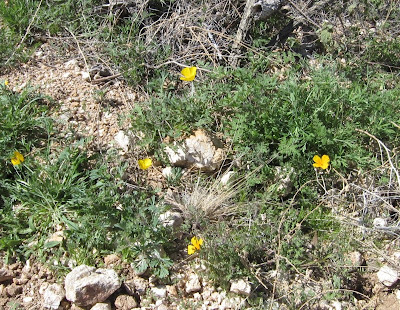 We saw our first wildflowers including poppies, fairy dusters, and a few unidentified shrubs with white flowers on them. 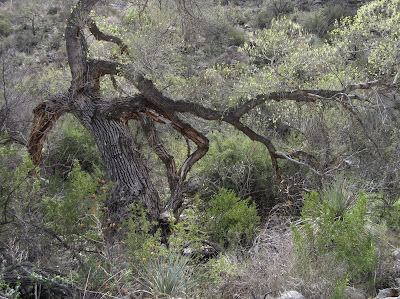 In addition, the new sprouts are really growing fast in this warmth and the first buds have burst into small leaves on the willows, mesquites, and other shrubs. 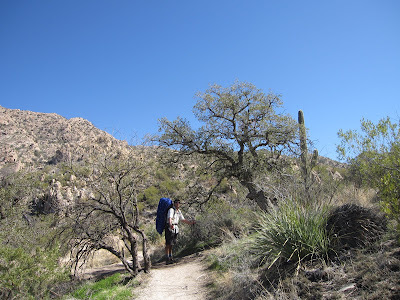 We also loved the hike in that the ridge above the pools was more than 4000 feet, which meant we got into some higher elevation vegetation including beautiful Arizona live oaks and magnificent sotols. Hilina had a wonderful time searching for aquatic insects with me in the stream. 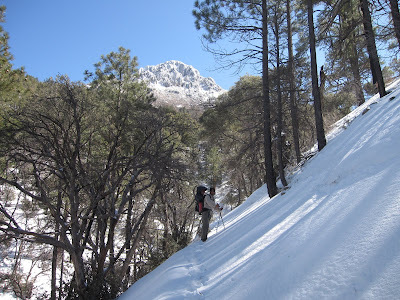 It was also such a neat site looking up at the 8,000 foot ridge above at the snow covered rocks and clearly visible Douglas firs and Ponderosa Pines above. You can not ask for a better day than a nice 6 mile round trip climbing 1500 feet, cooling off in the pools, and then returning back "home" to have a beer at sunset!